This project is a rebuilding of a head office building located in Nagoya-port which is for the company conducts overseas general logistics mainly shipping trade. One of the company's concept is the sense of unity so that the connection between each others is important for them. To embody that concept, we placed void to connect spaces visually and emotionally. That plan aims to create new office environment providing the employees productive interaction and the sense of unity. The building is 8 floors of double-core system and its shape is almost a cube approximately 30m on a side. We planed columnless space of 16m wide as a office room between two cores which being as a buffer zone against the external environment. 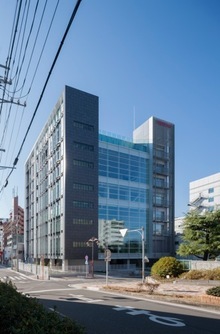 According to the degree of information security, the core's positions are decided which means the building shape itself shows the company's concept of security. We adopted aluminum louver having environmental adjustment function and Low-E grass as the exteriors wrapping those inside space to reduce air conditioning loads by preventing sunlight heat. Furthermore, we used PC panels made of natural materials to create various expressions of the exterior. Assuming the Tokai-Tonankai earthquakes, we need to strong structure wearing long-term like which symbolizes continuity of logistics itself. We adopted quake-absorbing structure of eccentric braces placed at the cores to provide large office space in the center. Additionally, we had conducted the countermeasures against ground liquefaction and also placed breakwater boards and the system to secure electricity in an emergency. Of course, we thought solar photovoltaic generation system was essential. We had simulated the time of disaster so those important equipments, as noted above, are placed at upper levels than ground. There are various types of office space such as the space having two floors void with a bridge over the cores, the space with outside deck terrace, and flexible conference room with movable partition walls. The other spaces like small conference rooms and print room are in the two cores. Those various rooms, laying on top of each other, create diverse quality of spaces.